Being from Lancashire, I wouldn’t know what a ‘cob’ was if it thumped me in the face. I personally only know and trust barm cakes, or ‘barms’. However, a ‘cob’ is apparently the word those from the Midlands use to describe a bread roll, causing all manner of confusion. I’ve only just learned this fact this morning, leaving certain UNILAD midlanders baffled. To me, a corn on the cob means a big buttery cob of corn, preferably grilled over the BBQ with a little paprika in the summer months. And 24-year-old Paige Hart was apparently of the same opinion. Heading to a takeaway in the Midlands with her boyfriend, 32-year-old William Maddock, Paige found herself craving the golden side dish. So she decided to throw caution to the wind and ask for a corn on the cob as part of their £14 order. 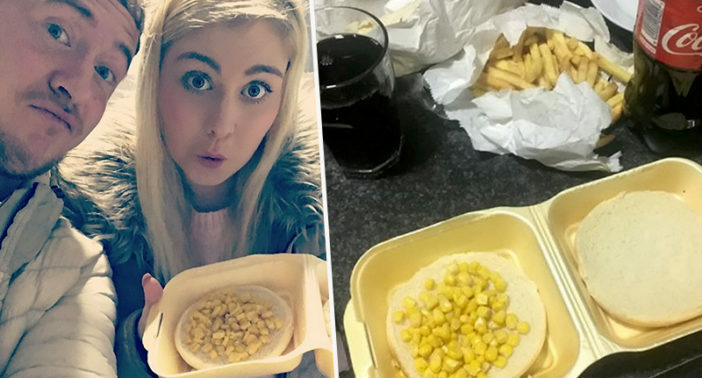 However, after bringing their food home to their flat in Carlton, Nottingham, Paige found out she’d been given individual kernels of sweetcorn on a bread roll. Me and William wanted something to eat before we got home and couldn’t be bothered to cook. It’s a bit like Nando’s so we ordered our chicken. I turned to William and said I fancied I corn on the cob so I asked the guy behind the counter if he did it. At first he looked at me a bit weird and said ‘of course darling’ and bagged it up. We were just gobsmacked. We were both in stitches as he took it so literally. What some people call baps we call cobs so he took it literally. However, this was sadly not the case for poor Paige who understandably wasn’t tempted by this bizarre and unappetising looking butty. The thing is it didn’t even have butter on, and I still was really craving a corn on the cob. It’s not nice without butter. We didn’t eat it in the end. We took a few pics and put it in the bin. Just last year, a YouGov study revealed over 50 per cent of people in Derbyshire, Leicestershire and Nottinghamshire refer to a a bread roll – or to give it its correct title ‘barm cake’ – as a ‘cob’. This is truly a linguistic issue which has divided the Midlands down the middle like a soft, floury bun. Will Paige’s story help to sandwich them back together?